In a recent tech news program, a journalist implied that the real competition to Blu Ray discs wasn't Netflix streaming, Hulu or even devices like Xbox or Roku. It's The Pirate Bay and other bittorrent sites. At first blush, this seemed to be overstating the case. But after further consideration, I believe the competition from non-sanctioned downloads is very real. And not because of the price. I no longer have a regular TV so ALL of my video programming comes online or on-disc. After all these months, I can finally resist the compulsion to let the TV schedule control my evenings. Last week I really wanted to watch a comedy program I hadn't seen in over a year. It's a "basic cable" sort of program. I don't think it has a particularly large following. Lots of clips from the program, but no full episodes. iTunes carries many tv programs. Some in HD. Like I said, I really wanted to see the program and would gladly pay a little bit for the privilege. But again, just the same clips found on Hulu. To the Source: The network web site. Won't identify the network, but not a lot of streaming content. It IS basic cable, after all. End of the Line: Program web site. Visiting the actual program web site got me the podcast feed, schedules and such. But streaming video was limited to most recent clip from the podcast. With all my legitimate sources exhausted, I just searched for a torrent. Current episode in gorgeous HD was in my video player in 20 minutes. And there's the problem: My experience using the "pirate" tools was vastly better than the experience presented by the publisher. The Music Industry had a similar problem until iTunes came along and created a better user experience than the wooly-bully pirate networks. I think that video and movie producers are going to have a tougher time reaching this experience threshold than the music industry. The television networks think they've already "gotten ahead of the situation" with Hulu and their own web sites, but they are locking their content to specific playback mechanisms and time frames. And these online versions are inferior to the broadcast versions - much less a good HD digital experience. Meanwhile, the torrent trackers have been steadily improving their "product." The music publishers were dragged kicking and screaming to a new delivery system by Apple. For video content, it looks like the savior may be Netflix running on an Xbox or Roku. I expect the gap between sanctioned online viewing and "pirate" video will get wider until the networks realize they need to compete on quality of experience. And that doesn't look likely in the foreseeable future. 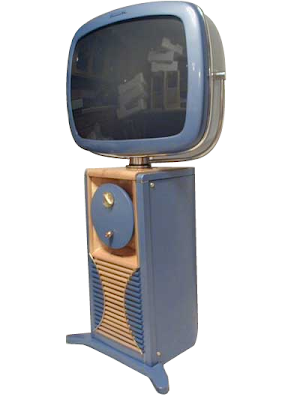 The Predicta Television pictured was built by Telstar Electronics.